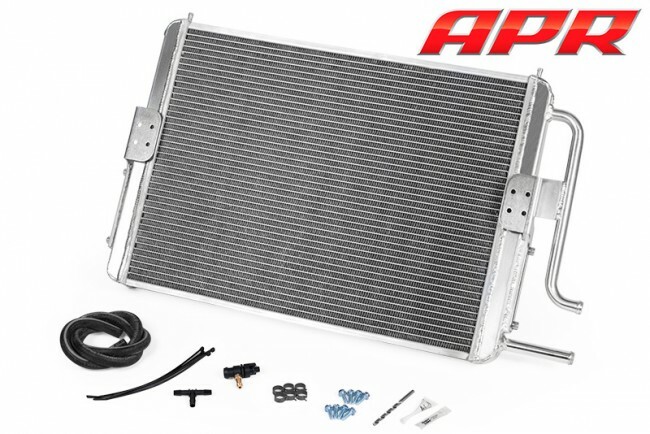 The APR Coolant Performance System (CPS) is a massive front-mounted cooler upgrade that dramatically reduces intake air temperature (IAT), minimizes heat soak, and provides increased performance! It is 140% larger than stock and features a self-bleeding cooling circuit to ensure it is always operating at peak performance. The system is easy to maintain and fully integrated into the factory cooling circuit. This upgrade is highly recommended at every stage. The front mounted radiator is tiny. Air trapped within the system devastates the cooler's effectiveness, while the sheer lack of surface area and coolant volume makes for a system incapable of keeping up with the cooling demands at higher performance levels. The APR Coolant Performance System replaces the front mounted radiator with a much larger and more capable dual-pass unit. It has 140% more frontal surface area and holds 141% more coolant than the factory unit. Tightly packed louvered fins rapidly dissipate heat over a much wider area than the factory unit. Next, APR CPS incorporates a unique self-bleeding system into the cooler design. Keeping up with manual bleeding is messy, and all but impossible. However, the APR system continuously self-bleeds, increasing the coolers effectiveness automatically! The result is simple: More horsepower over a much wider operating range! APR's engineers conducted a multitude of tests on the street, dyno, dragstrip and race track with thermocouples placed at the inlet and outlet of the radiator during the design phase. Data from these tests were used to choose the radiator design available today. With the radiator in its final production form, tests were conducted against the factory radiator to measure the effectiveness of each system. Testing conducted on the dyno provided a semi controlled environment for back-to-back stress testing the two systems. Utilizing a B8 S4 3.0T at APR Stage II+ Ultra power levels, six back-to-back dyno pulls were conducted with minimal cooldown time between runs. APR's ECU Explorer high resolution datalogging system was used for raw sensor data collection. Using the APR Radiator, horsepower remained consistent for the first four back-to-back dyno pulls. By the fifth back-to-back pull, horsepower dropped slightly when the IAT protection threshold was crossed. The threshold is designed to bypass boost pressure to cool off the system and protect the engine. The OEM intercooler did not fare so well. Horsepower began derating on the first pull and the IAT threshold was crossed by the end of the first dyno pull. This trend continued dramatically, resulting in massive power losses to protect the engine from excessive intake air temperature. The factory cooling system simply did not stand a chance. Ultimately peak horsepower dropped to as low as 260 AWHP, whereas the APR cooling system retained over 400 AWHP, even after the sixth consecutive back-to-back pull! NOTE: Some cars will require the APR Fit Kit. 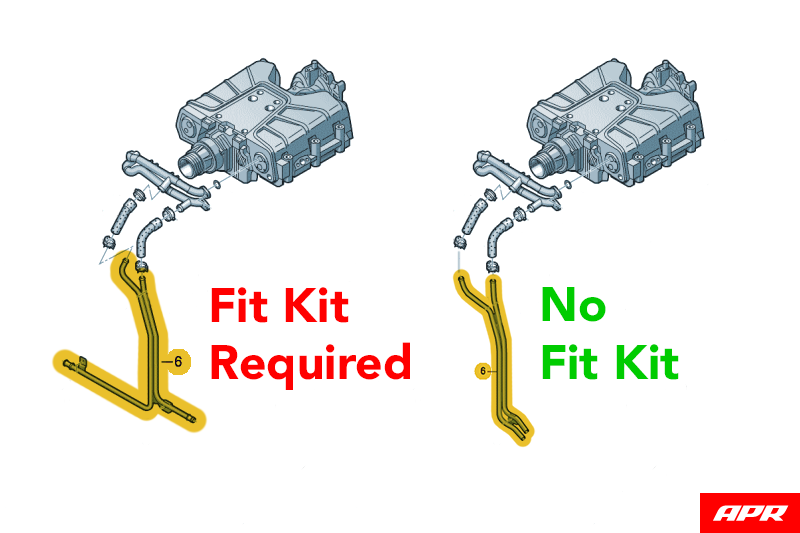 If your vehicle requires the Fit Kit, please select the option.